Katherine Starbird, author of fantasy, romance, adventure. I love teaching other writers. To that end, the new post is Resources for Authors. It’s chock full of advice, useful books and such; check it out. As I ramp up for an all-day workshop on creating a fictional world that I’m presenting for the Florida Writers Association, I’m thinking a lot about world-building and what makes good fantasy work. Let me know your thoughts and questions. And if you are in Central Florida this Spring, consider coming to The Writer’s Nest Conference on April 30. Poet Laureate of Florida Peter Meinke will be there to present an afternoon session. If I wasn’t speaking, I’d be filling a seat in the front row! The Jaguar Key is now available in paperback and eBook formats. It’s the story of a former South-American Jaguar goddess masquerading as an ordinary human in modern Washington DC. She’s a goddess with man trouble, stalkers and secrets! The book took first place in the 2014 Royal Palm Literary Awards of the Florida Writers Association. 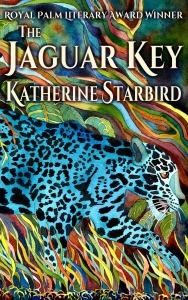 The Blue Jaguar painting on the cover by artist Kathy Park depicts the surreal feel of the story where legendary creatures clash in modern-day America. The novella Reenie Gyse is the story of a young man who wants to disown the memory of his father. When a supernatural force traps him in a city marina, he struggles to claim his birthright before he loses his identity entirely. This sea story loosely based on a group of sailing friends that met every Wednesday night throughout the 1970s for an evening sail. Of course, my version is a fantasy, complete with Norse gods and mythological creatures. Reenie Gyse is available in paperback and ebook on Amazon, Kobo, B&N, Smashwords, and other sites. My work in progress is set back in modern times. It’s the story of Winona, a young Appalachian woman who sees spirits so clearly that they seem alive. If all goes well, it will be out in the Fall. You can find me on Twitter (@Kate_Arletta) and on Facebook using the Follow Me buttons to the right or get a copy of my news delivered to your email (infrequently) by clicking this link. You’ll receive updates about upcoming events and publications. Congrats on Rosamond. I can’t wait to see it in print!